There are three races in UniWar, each having their own units with varying attributes and abilities, strengths and weaknesses. 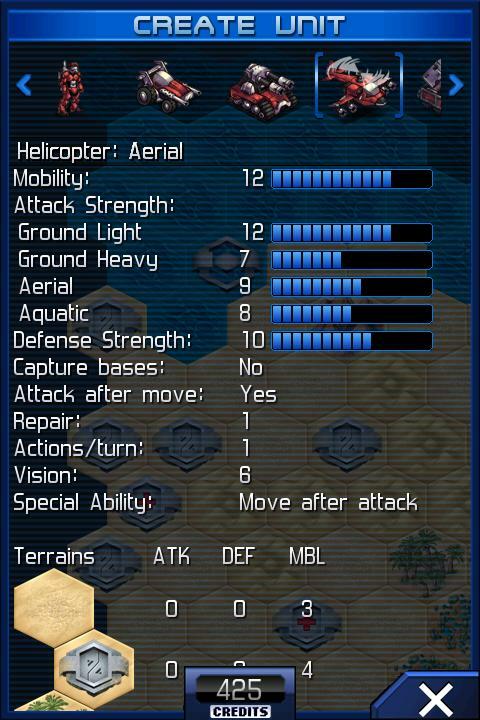 The type of unit indicates the amount of damage it can receive from other unit types and how its movement is effected by the terrain on the battlefield. Terrain can increase or decrease the unit's strength and can slow down its movement or prevent it from crossing that area. The unit and terrain specs can be seen in the Info screen or while creating units at a base. At the start of your turn you receive credits for every base you have captured. These credits are used to build your army. Capture more bases to gain more credits. Harbors must be captured to build Aquatic units, but these do not gain credits. Medical bases cannot be captured, but can be used to repair units more quickly. Only certain units can capture bases. During your turn you can perform various actions using your available units and bases. After completing an action the unit will be unavailable until the next turn. The basic actions are to move, attack, stay, capture and repair.